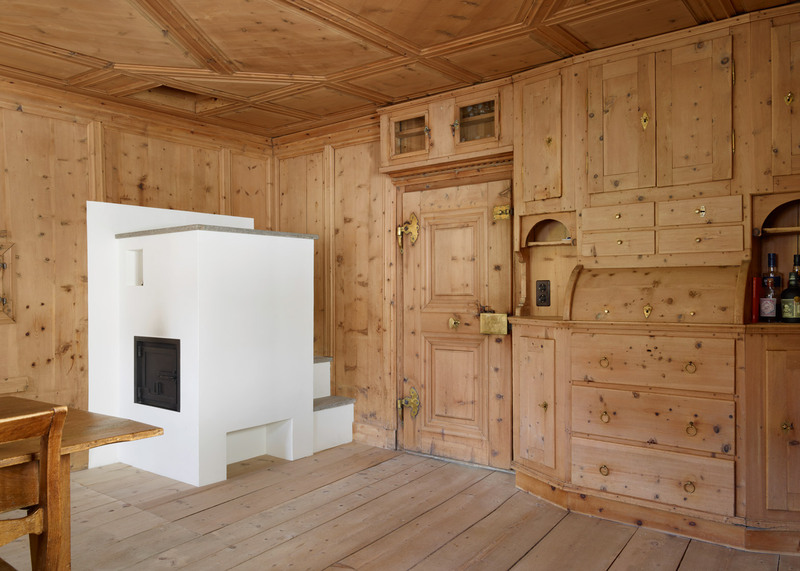 Berlin studio Baumhauer has renovated a traditional farmhouse in the Swiss hamlet of Florins, inserting a timber structure that contains new living areas in place of an existing barn (+ slideshow). 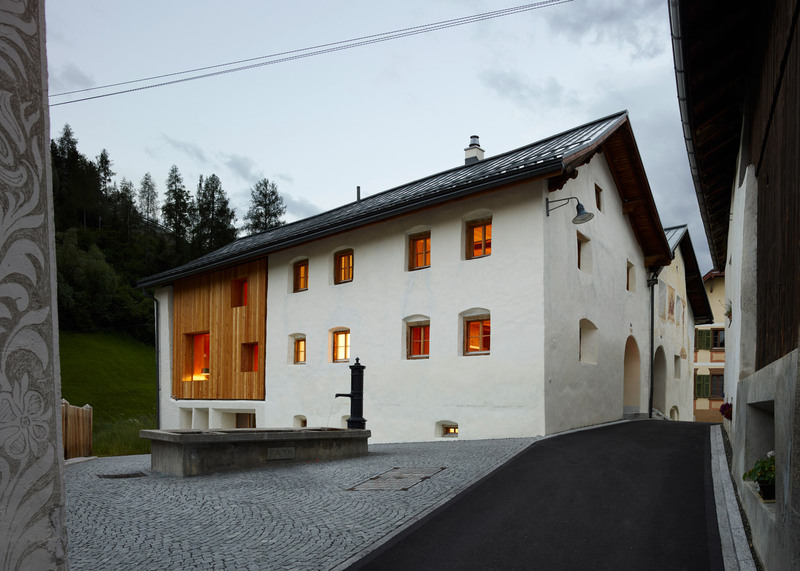 The farmhouse is typical of vernacular architecture in Switzerland's Engadine valley. It originally incorporated residential spaces towards the front, where it faces the village centre, and an area for agricultural purposes at the rear. 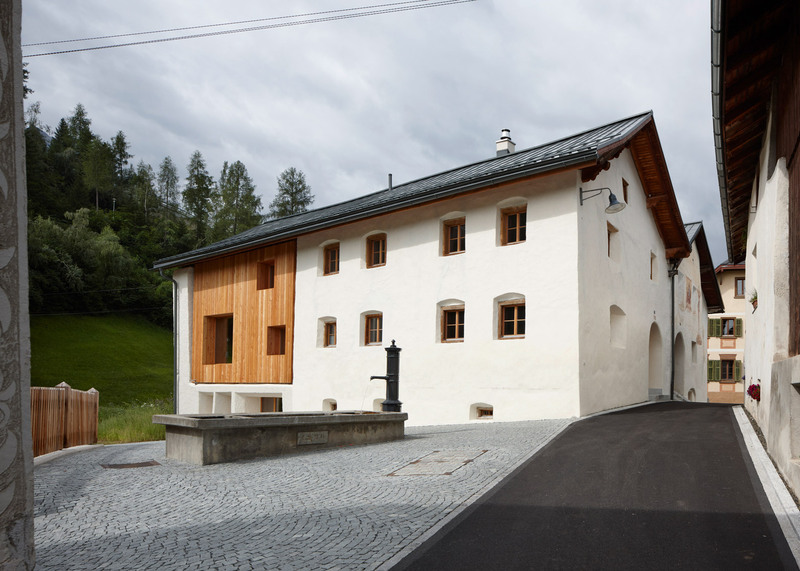 Baumhauer focused on expanding the existing residential programme into the redundant barn at the back of the building in a way that is sympathetic to its historic fabric. 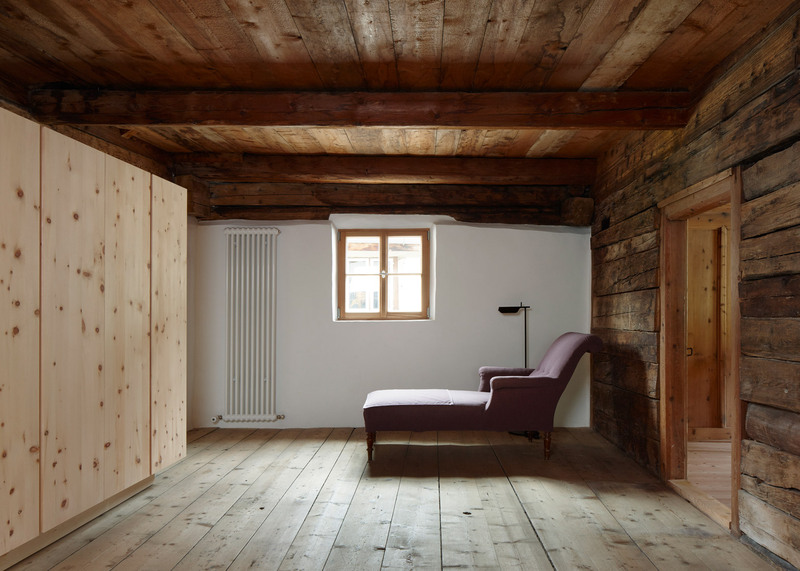 The barn's original floor was removed to make room for a three-storey structurally independent timber volume that sits within the existing stone walls. The wooden addition interrupts the otherwise homogenous white-rendered facades. 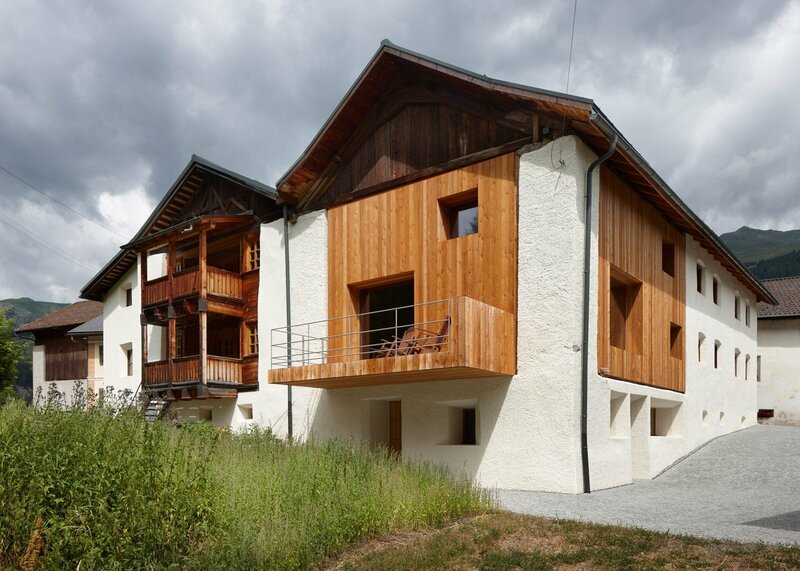 Its proportions match those of a balconied structure that projects from the rear elevation of the adjoining building. "The typical local motif of deep window reveals in thick exterior walls has been adopted and exaggerated, signifying the alterations inside," the architects explained in a statement. 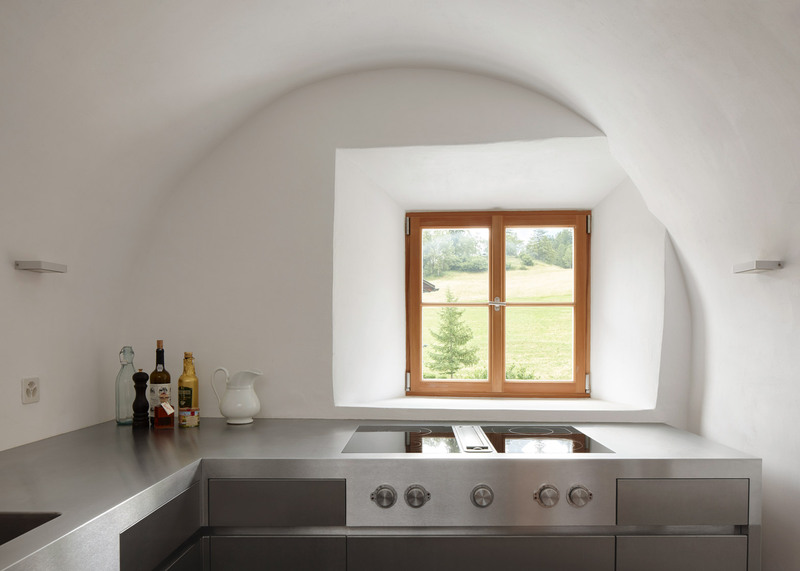 "With their sharp-edged detailing, these few large window openings stand out in contrast to the existing architecture." 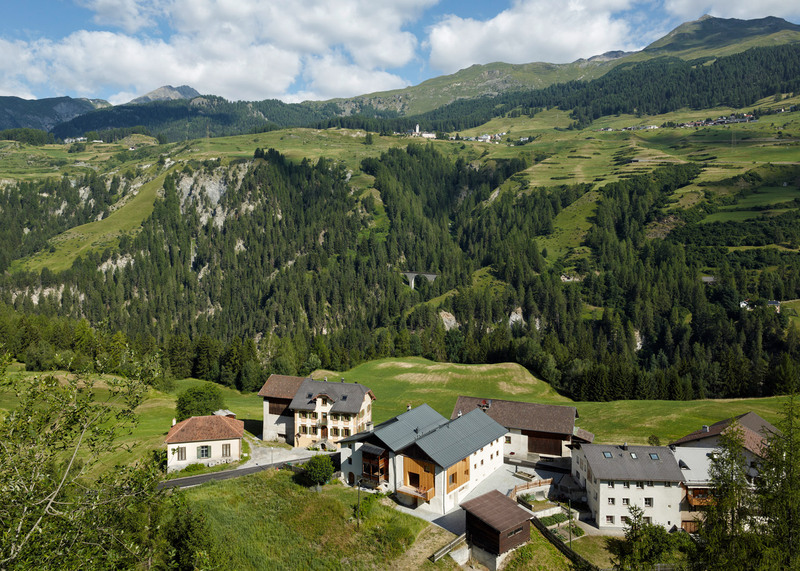 Rough-sawn untreated larch was chosen for the exterior elements to reference the region's traditional agricultural structures. Its surfaces will gradually weather and age, helping the building to blend into its context. Inside, a double-height living room that extends up to the roofline is lined with larch wood, creating a continuous surface that emphasises the impressive dimensions of the space. 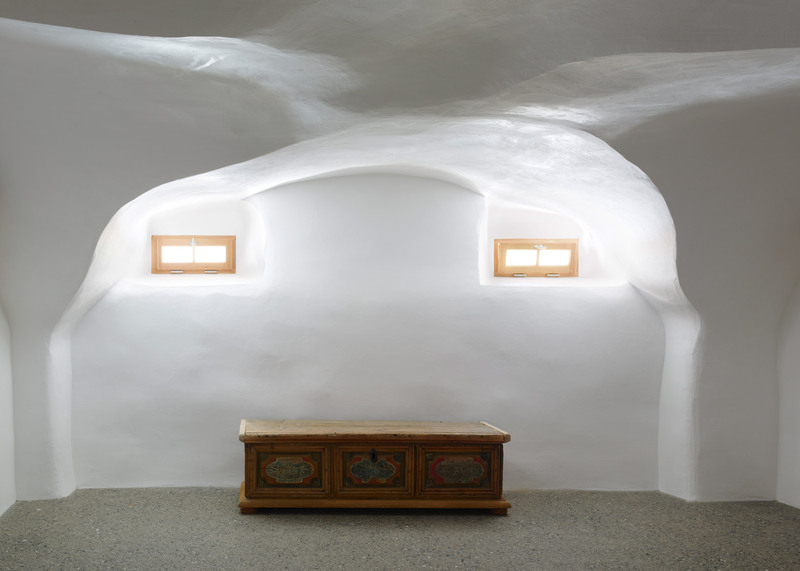 "The design allows the historical large volume of the barn to remain legible despite the changes," the architects added. 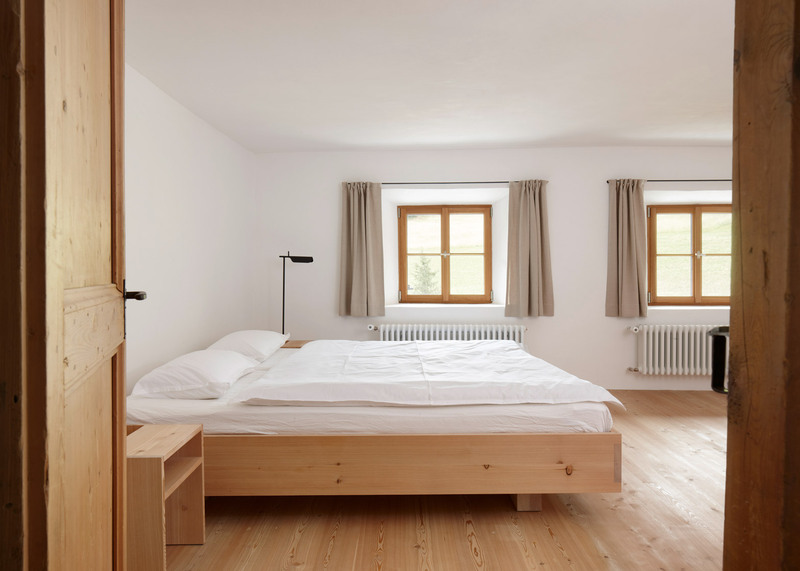 The timber structure also accommodates four additional rooms, including a double bedroom and bathroom on the upper storey, and a smaller single room next to the living area. 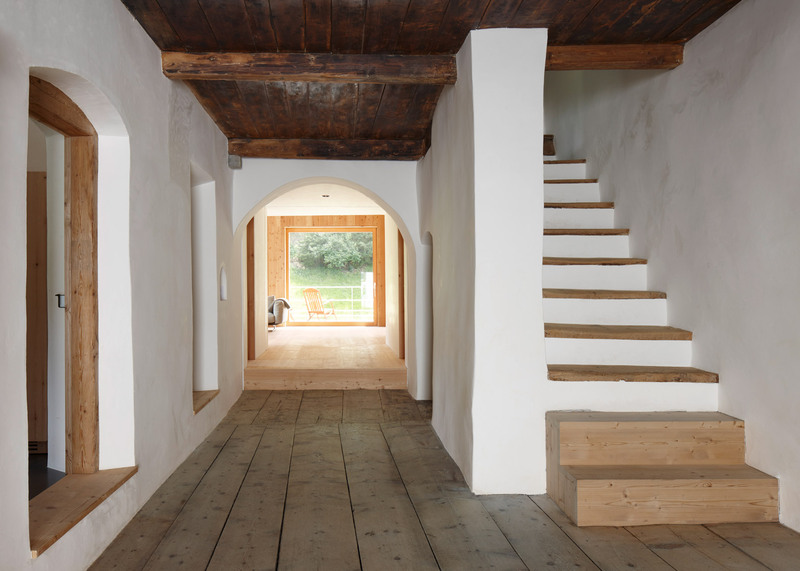 A corridor that extends the length of the house connects its original living spaces with the timber-lined insert. 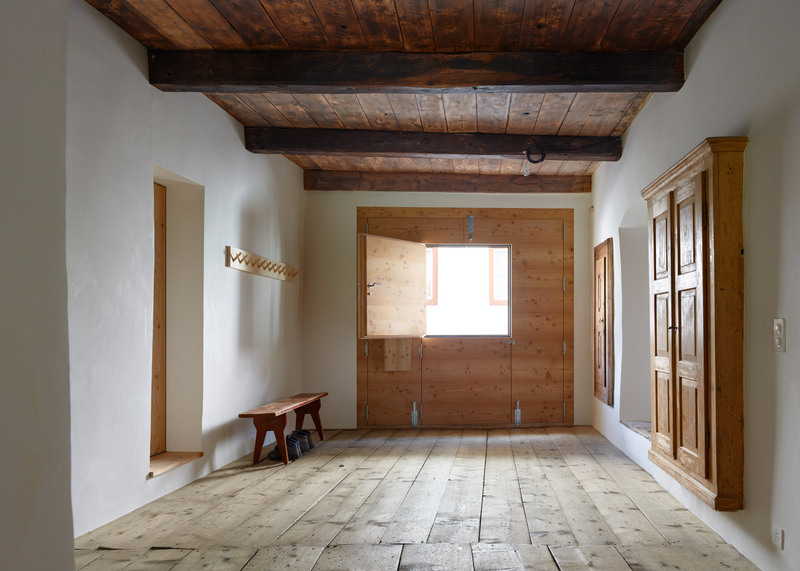 From the front entrance area, the transition between old and new areas is marked by the change from traditional wooden floorboards to the larch surfaces. A sliding glass door at the rear of the new living space looks out onto the adjacent hillside and connects this space with a balcony that projects from the facade. The rest of the house was extensively refurbished, including an elaborately panelled dining room and a neighbouring kitchen with a vaulted roof. 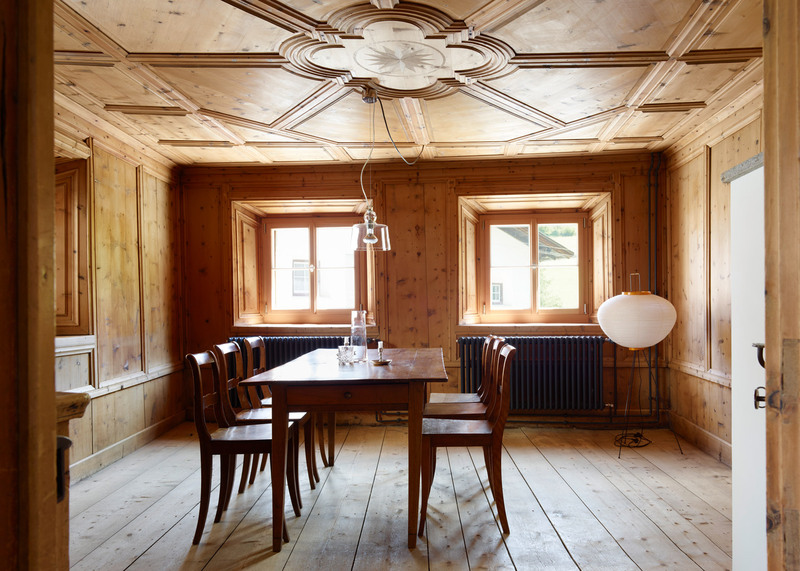 Architect Philipp Baumhauer's previous projects include a glass and steel poolhouse in Munich and a wooden folly with mirrored shutters in the mountains of southern Germany. British studio Snook Architects has also converted a former barn into a home featuring exposed wooden trusses, while a barn in Japan's Ibaraki Prefecture was transformed by Kichi Architectural Design into a home with a mezzanine below its four-metre-high ceiling. 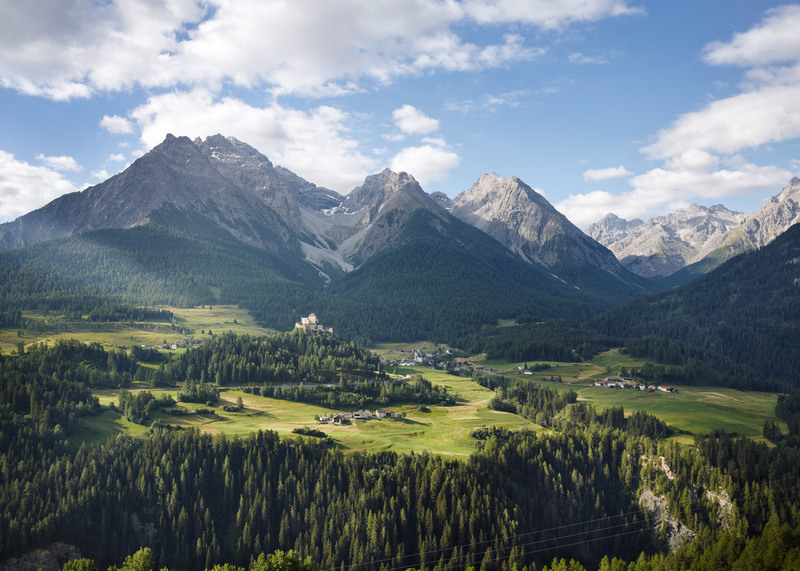 Photography is by Ralph Feiner.